We are happy to once again have our honey in Brown’s Smokehouse Meats! Unfortunately, by the time Senate Bill 500 took effect in August 2015, Winfield had suffered heavy flooding and the old Brown’s store was a total loss. Now, after two and a half years, Brown’s has reopened on Cherry Street in Troy, under the name of Brown’s AroundThe Block. They once again offer some of the best meats around, along with many local products – including Sweet Harvest Honey! 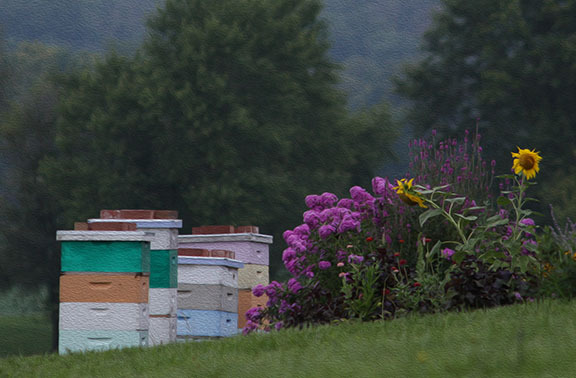 Four years ago we moved bees from Kirkwood, Missouri – the heart of the St. Louis suburbs – to our new home in rural Lincoln County. We live in a development that was cut out of farmland in 1999. Its 33 properties range from two-and-a-half to five acres, and perhaps 20 are occupied. The tiny town of Foley (population 161) is about a mile away, and except for a few patches of trees we are otherwise surrounded by agriculture – mostly corn and soybeans rotated year to year. It’s all GMO (Roundup Ready), the corn seed-treated with neonics. One would think, from so much that we read and hear, that this would be the worst possible place to bring bees. As it happens, not only do our bees do as well here as they did in the burbs, but I have never seen so many native pollinators! Diane and I have two-and-a-half acres, including a 40×80-foot garden where we plant all kinds of veggies, herbs and flowers. Native wildflowers bloom in parts of our yard, along the ditches and on the undeveloped lots – which generally get mowed about once a year. But here’s what’s interesting. We have six beehives in the backyard, so there are perhaps two hundred thousand foragers heading out each day to parts unknown. I say parts unknown, because as I walk around the garden, the yard and the neighborhood, I mostly see everything BUT honeybees! We have a plethora of carpenter bees and at least two species of bumbles. There are squash bees on the squash, and sunflower bees on the sunflowers. I see mason bees, digger bees, tiny brown sweat bees, those really cool metallic green sweat bees, and some other bees I can’t identify. We also have a bunch of different moths and butterflies, and some cute yellow googly-eyed flies. Even a few wasp species get in on the action. I never saw that kind of pollinator diversity in Kirkwood, or back in Wisconsin on my parents’ dairy farm. Now, when my little plot of buckwheat blooms, it literally hums with honeybees, along with numerous other critters. Ditto for the peach trees, blackberries and clover. For most everything else, the natives have it covered. So where am I going with this? Well, last summer, a man from the Missouri Department of Conservation called and asked me to talk about honeybees at the State Fair. Among other things, he wanted me to discuss current challenges facing the bees, and their role in our state’s food production. A day or two later, he called back with a change in plans. Some of the MDC higher-ups, it seemed, were not too keen about the focus on honeybees; while this “invasive species” holds some importance to Missouri agriculture, the Department has a preference for native pollinators. Would I be able to talk about them as well, or did I know anyone who would? I referred him to Ed Spevak, Curator of Invertebrates at the St. Louis Zoo. I’d heard Ed speak twice, at the Zoo and at our local bee club, and he truly is an expert in this field. So MDC scheduled four one-hour lectures – before and after lunch on Tuesday and Wednesday. Each hour would be split between Ed talking native pollinators and me discussing Apis mellifera. The outdoor venue – a small amphitheater adjacent to the Conservation Building – made PowerPoint impossible, but at least the short time-frame allowed for easier memorization. I touched base with Ed and we decided we’d each talk for about 25 minutes and then share the stage for a 10-minute Q&A. The problem with that approach quickly became apparent when Ed went first and covered about half my subject matter! The good news was, this left me time to respond to some of his other points, and also made me glad I wasn’t using a slide show. Ed spent a good portion of his talk explaining how honeybees are not really very efficient pollinators. On a bee-for-bee basis, many if not most of the native bees do a better job, and some seem to have evolved to pollinate specific species. Bumblebees do a better job of shaking loose the pollen on many flower types, and they work in colder, wetter weather than our bees do. Orchard and mason bees are much more efficient in apple and pear trees – in part because they are attracted by the flowers’ pollen, whereas honeybees come only for the nectar. And like the highly specialized sunflower and squash bees, blueberry bees are perfectly designed for the “buzz pollination” required by that plant’s flowers – a trick for which the honeybee is not so well adapted. All of that is true as far as it goes. And as my experience has shown, the average homeowner probably doesn’t need to install a beehive to have a successful garden. If you or I plant a packet or two of pumpkin or zucchini seeds – or turnips, or peppers, or sunflowers – there may well be enough native bees in the area to get the job done. But, as I explained to the fairgoers, that’s not how most of our food is grown. There are over three hundred million people in the United States. Very few have the time and the space to grow a garden, and those who do cannot hope to grow all that they need for subsistence. Even full-time farmers specialize in crops that pay the bills, and buy most of their own food at the store. So like it or not, the bulk of our food comes from production agriculture. Big Ag, if you will. Even the produce you buy at your local farmers’ market is likely grown in several-acre fields, with seed planted by the sack rather than the packet. This production agriculture requires production pollination. Most crops only bloom for a matter of weeks, and it may be raining for half that time. So you can’t always rely on whatever bees happen to be in the area; when your livelihood depends on it, you bring in the big guns. Over half the nation’s managed honeybee colonies go to California every year for the February almond bloom. But that’s not the end of it; many of those colonies then migrate to apples, cherries, pumpkins and other crops. Some 400,000 honeybee colonies were rented last year just for blueberries. That is not to say that the natives aren’t important. And when I give talks to the public, people always ask what they can do to help these pollinators. You can begin, I say, by calling off the war on weeds in your own yard. 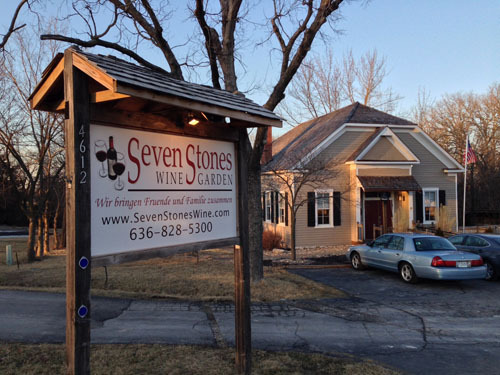 I use the example of the landscaping company that advertises a “barefoot lawn”. They come in and kill all the dandelions, clover, violets and anything else that threatens to make your yard interesting. Then they plant a lush carpet of non-native grass that requires constant moisture to stay green. So you end up putting more water on your lawn than in your swimming pool, and more gas in your mower than in your Suburban. All in all, this “barefoot lawn” costs you hundreds of dollars per year. — A version of this story was published in Bee Culture Magazine in August 2017. They actually remain quite active, and you will see them out and about on days when temperatures approach 50°F. In fact, the honeybee is the only type of bee or wasp that remains active throughout the winter. When the weather is very cold, the bees form a tight cluster in the hive – the colder the temps, the tighter the cluster. They actually disengage their wings and vibrate their flight muscles to generate warmth, and bees on the outside migrate to the inside to keep from freezing. 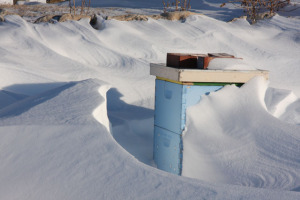 It is not uncommon for bee colonies to die during the winter months, both in managed hives and in the wild, but this is not from cold weather per se. Viruses and other diseases that the colony can withstand during the summer months sometimes prove too much during the winter, in large part because population growth can no longer outpace the problem, and sick bees cannot leave the hive to die away from healthy individuals. But for the most part, so long as the colony is reasonably healthy and has adequate food stores, it should survive the winter. The surplus of honey that the colony stores during the warm months serves as its food supply in times when there is no new nectar available. A typical managed colony, in a good year, can store much more honey than it requires for overwintering. Just as Holstein cows have been bred over centuries for milk production, bees have been selected in part for honey production. So a good colony can produce upwards of 200 pounds of honey for the beekeeper, in addition to its own annual usage of perhaps 300-400 pounds! This is truly remarkable when you consider that a single worker bee will only produce about one-twelfth of a teaspoon of honey in its 6-8-week lifetime!